Unless the middle class in society perceives that it derives some benefits from the state, it will be unwilling to finance redistribution, notes Arvind Subramanian. This United Progressive Alliance government is heading into the 10th and possibly last year of office, a tenure whose crowning achievement might well be the Food Security Bill. One may fault this government for incompetence, corruption, and delayed action but it cannot be faulted for lacking a vision. There has been an overarching idea that underlies many of its economic policies: namely, that the poor and underprivileged in society must be empowered by conferring them with new rights -- to work, education, food, and presumably, all basic needs. 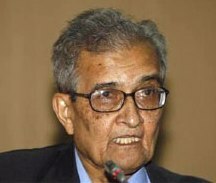 Call this the redistribution through rights and entitlements approach, which is now associated with the articulate advocacy of Professor Amartya Sen, channelled effectively into policy through his co-author and long-time collaborator Professor Jean Dreze. Their latest book is a cogent exposition of the RRE approach. Nobody can question the moral urgency of helping the poor which is the key objective underlying this approach. But that should not exempt its methods and consequences from critical scrutiny. And this scrutiny reveals some serious failings. 1. RRE causes instability and vulnerability: Amongst emerging markets, India is the most macroeconomically vulnerable, with a deadly combination of high fiscal deficits, close to double-digit inflation, and high external deficits financed by short-term foreign capital inflows that may even now be starting to flow out of the country. How did we get here, though? Much of the blame must lie with the redistributional zeal of this government. The ultimate cause of macro-vulnerability is the high fiscal deficits in turn caused by the fact that government spending per capita (intrinsic to RRE) has increased by nearly 75 per cent by under this government (see Figure 1). 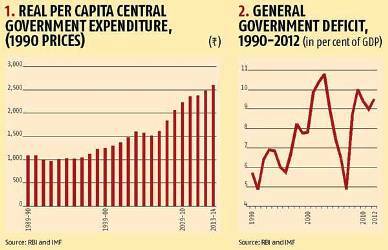 This spending contributed to instability directly, because it pushed up rural wages and procurement prices, thereby stoking inflation; and indirectly, because it put aggregate demand on steroids, even as supply capacity was left to languish, weak and under-nourished. For some time, the macro-economic damage caused by RRE remained obscured. Headline fiscal deficit numbers actually declined during UPA-I, because its tenure witnessed a dream combination of high growth and low interest rates which should have resulted in headline deficit numbers substantially below actual ones. Similarly, headline fiscal debt numbers have declined throughout the UPA’s tenure, but for bad reasons -- India has reduced its debt through sustainedly high inflation. The government may have gained by this, but the aam aadmi has suffered, since his capacity to hedge against inflation is limited. And now, the underlying damage to the overall economy has been exposed now that international investors have become less willing to finance India, as reflected in the plight of the rupee. 2. RRE legitimises atrocious policies: If one were asked to single out the worst economic policy in India, energy subsidies – for diesel, kerosene and above all power -- must be a strong contender. Consider the bad outcomes that power subsidies cause or abet: bad crop mix, depleted water resources, unprofitable and mismanaged state electricity boards, under-investment in power, lower economic growth and higher carbon emissions. Now, politicians promising subsidised power for electoral reasons is understandable. That is part of the hurly-burly of grubby politics. But intellectuals providing legitimacy to these policies is another matter. Intellectuals on the Left cannot expect to be exonerated on the grounds that they have not explicitly advocated subsidised power. After all, if there is a right to cheap food and education why isn’t there one also to basic energy needs and hence to subsidised power for the poor? And this is not a slippery slope argument -- because India has slipped already, finding itself at the slope’s bottom which is the shambolic mess that is the power sector in India. 3. RRE undervalues opportunity costs: Governments have limited political capital and must hence prioritise actions, choosing those that maximise bang for the buck. In this view, RRE is problematic because it leads to sub-optimal policy choices. So, instead of enacting a right to education act, why not focus on getting teachers to show up for work, that would have a far greater impact on educational outcomes? Similarly, instead of an employment guarantee scheme, why not create sustainable opportunities for employment creation by eliminating regulatory impediments? The government could defend its choices by invoking political constraints: absentee teachers in rural India cannot be fired because they are also party apparatchiks, and labour laws cannot be amended because of vested interests. But the problem with votaries of the RRE approach is they don’t apply the same analysis to their preferred policies. Will RRE not run into the same political and bureaucratic constraints? 4. RRE overburdens state capacity: Indeed, one of the supreme ironies of the Left in India is that it has been so disrespectful to its core belief in a strong state. Several commentators have noted the problems of creating rights without the ability of the state to honour those rights. The public distribution system is broken but instead of being fixed or replaced, it is being asked to do more. It is as if an emaciated, old man struggling to carry a load of stones is asked to carry another load because that will strengthen his muscles. What is worse is that the Left has been ambivalent about or even hostile to the one genuinely important and far-reaching attempt at building state capacity in India: the Aadhaar scheme (yes, it is really hard to think of any other state capacity-building initiative). Regardless of the merits of direct cash transfers (which is only one potential application of the biometric identification project), the important point is that Aadhaar seeks to harness technology to strengthen the ability of the state (and also the private sector) to deliver services in the long run. The Left in particular should be celebrating rather than griping about it. 5. RRE undermines the state: Intellectually, the most damaging consequence of RRE in India, and least recognised, is that it does not just burden the state, it has the potential to fatally undermine it. How so? The evolution of the state provides one important lesson pointed out recently by Professor Indira Rajaraman of the National Institue of Public Finance and Policy. The history of Europe and the US suggests that typically, states provide essential services (physical security, health, education, infrastructure, etc.) first before they take on their redistribution role. That sequencing is not accidental. Unless the middle class in society perceives that it derives some benefits from the state, it will be unwilling to finance redistribution. In other words, the legitimacy to redistribute is earned through a demonstrated record of effectiveness in delivering essential services. A corollary is that if the state’s role is predominantly redistribution, the middle class will seek -- in Professor Albert Hirschman’s famous terminology -- to exit from the state. They will avoid or minimise paying taxes; they will cocoon themselves in gated communities; they will use diesel to obtain power; and they will send their children overseas for higher education. All these pathologies are in evidence in India. By reducing the pressure on the state, middle class exit will shrivel it, eroding its legitimacy further, leading to more exit and so on. A state that prioritises or over-emphasises RRE, risks unleashing this vicious spiral. For this admirer of Professor Sen’s exceptional academic work two ironies stand out. His Nobel-winning insight was about the importance of broad purchasing power rather than the narrow (physical) availability of food in avoiding famines and mass starvation. It is curious, even mystifying, therefore, to see him forcefully advocate, through morbidity-laden polemic, the physical provision of one type of food -- cereals, which are rapidly declining in people’s consumption basket -- to help reduce malnutrition. His second major insight was that development was about freedom, especially the freedom to exercise choice. Yet, the RRE approach has privileged paternalism -- by determining that the poor need specific assistance -- over expanded choice in the form of 'untied' cash transfers or broader employment opportunities that enhance purchasing power. If there is a tension, even contradiction, between Sen, the academic and Sen, the advocate, this government might, in the twilight of its tenure, do well to ask itself: did we draw our inspiration from, and put faith in, the wrong Sen? Is Rohan Murty's entry into Infosys JUSTIFIED?